Can I become a member when I register? Yes. First, you must have an SNL Account. If you do not yet have an SNL Account, please Create An Account. If you already have an SNL Account, please Log In to register. After logging in, your membership status will be displayed at the top of of your Account Home Page. From the Account Home Page, click Join or Renew if you need to join SNL or renew your membership. After completing your membership, you will be able to register and receive the member registration rate. I’m unable to pay by credit card. Are other payment options available? You may also send a check payable to Society for the Neurobiology of Language. First, complete the registration information and PRINT A COPY to include with your check. Send to: SNL, 19 Richardson Rd., Novato, CA 94949. Checks received without registrant information cannot be processed. I do not have a PayPal account and/or do not want to create one. Is there another way to make my payment? You do NOT need to have a PayPal account to use PayPal. Select “Pay with Debit or Credit Card” located below the PayPal login fields. You may also contact us to make other payment arrangements. I need to cancel my registration. Can I get a refund? See our Registration Cancellation and Refund Policy. I need a Certificate of Attendance. How do I request one? At the meeting, please visit the Onsite Registration Desk and ask for a Certificate of Attendance. We can only issue Certificates of Attendance at the meeting. I need a Letter of Invitation for my VISA. How do I request one? Email your request to registration@neurolang.org. 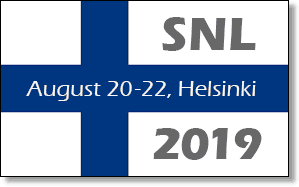 Guests are allowed complimentary entry into one SNL session (for the purposes of seeing the poster or slide of the person they are a guest of). Guests are welcome at all social functions (Opening Reception and Coffee Breaks). Guests must register at the SNL registration desk upon arrival and must be accompanied by the SNL attendee. Guests must wear a badge for entrance into the session they are attending and for social events as well.